The entrance (right) to the inner bailey of Ludlow Castle, next to the keep (left). What is now the inner bailey marks the limit of the Norman castle. For the Constable of Chester, see Roger de Lacy (1170–1211). Roger de Lacy (died after 1106) was an Anglo-Norman nobleman, a Marcher Lord on the Welsh border. 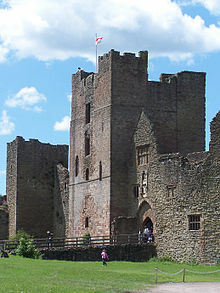 Roger was a castle builder, particularly at Ludlow Castle. From Walter de Lacy (died 1085) he inherited Castle Frome, Herefordshire. The Domesday Survey (1086) shows Roger holding also Ocle Pychard, Almeley Castle, Eardisley Castle, and Edgeworth Manor. He had an insecure lordship at Ewias Lacy now known as Longtown Castle on the modern day Welsh border., in Longtown, Herefordshire; Stanton Lacy was probably also his after Walter. His main stronghold was Weobley. He held directly from the King. He took part in the rebellion of 1088 against William Rufus, with the other local lords Osbern fitzRichard of Richard's Castle, Ralf of Mortemer, and Bernard of Neufmarche. He was later implicated in the conspiracy of 1095 against William, and was exiled. Weobley passed to his brother Hugh de Lacy who died before 1115 when the de Lacy lands passed to Pain fitzJohn. Roger's son Gilbert de Lacy spent much effort recovering the Longtown and Ludlow holdings. ^ Roger of Lacy, Lassy. Alternative spellings: Roger de Laci, Roger de Lacie, Roger de Lascy. ^ Fleming 2003, p. 166. ^ Frank Barlow, William Rufus (1983) p.82. Fleming, Robin (18 December 2003). Domesday Book and the Law: Society and Legal Custom in Early Medieval England. Cambridge University Press. ISBN 978-0-521-52846-7.